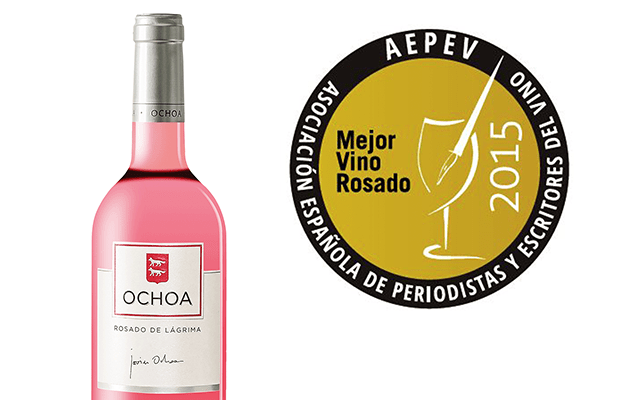 Members of the Spanish Association of Wine journalists and writers (AEPEV) in its VII edition of the best wines and spirits of Spain have given the second award to Ochoa Rosado de Lágrima. In the second round, the votes have joint 153 wines and 35 spirits in 11 sections among 700 brands represented in the contest. Andalucia has been the most awarded region with nine wines and spirits, while Navarra, Castilla Leon and La Rioja have been represented only by 2 wineries. Bodegas OCHOA starts the year 2016 winning another award for its wine portfolio. It is the time for one of the most famous rose wines of the Ochoa family, created by Javier Ochoa and made by saignee. The saignee method consists in a maceration process with the juice and the skins for a short period of time (4-6 hours), then ferment in a vat without pressing the grapes. Therefore the name Lagrima, means tear, because we take the best part of the juice to make this rose wine. “Saignee method involves 5 kilos of grapes to make one bottle of Rose wine. It is a very strict method to make high quality rose. The market and awards like this one confirms in our decision” says Adriana Ochoa, winemaker of the winery Ochoa. Ochoa Rosado de Lágrima is a rose wine that is chosen not only by the Spanish customer, but also by international markets. Beautiful pale rose color, fruity strawberry-like nose, long in mouth and with a wonderful structure.